IKO road offers a very complete range of products for the repair and renovation of road surfaces. 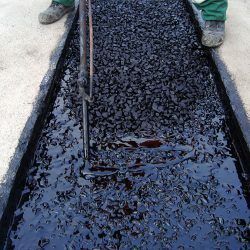 The product range includes cold asphalt in various qualities, depending on the application and the desired result. Standard cold asphalt is intended for temporary repair of damage. For the final repair of structural damage, IKO road recommends reactive cold asphalt. This fast curing product produces the same, sustainable results as hot asphalt. For renovation, too, i.e. the freshening up and preventive filling of small cracks, IKO road has suitable products. Semi-liquid thixotropic product based on bituminous emulsion, resins and fillers. Cold application reactive liquid cold hydrocarbon. Bituminous dry fast primer for cold hydrocarbon IKO pro tinascoat. 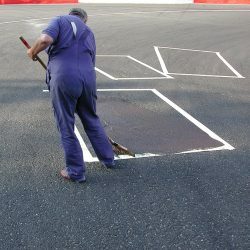 Temporary repair or resurfacing of hydrocarbon surfacing subjected to light or medium traffic. 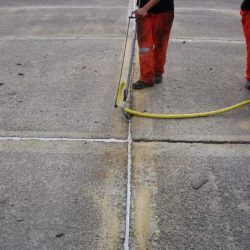 Primer to preparing a surface before using IKO rephalt and IKO oecophalt. Cold application reactive cold hydrocarbon. Cold application reactive cold hydrocabon. 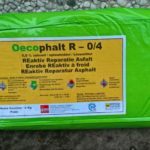 Mastic asphalt for repairing. 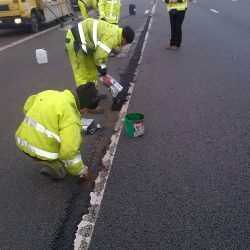 Repairing road in concrete or asphalt.